Strap in and lock your s-foils in attack position because one of the breakout stars of the blockbuster Star Wars(tm): The Force Awakens is coming to comics! Today, Lucasfilm Ltd. and Marvel Entertainment are proud to announce Star Wars: POE DAMERON #1, a new ongoing series coming this April! 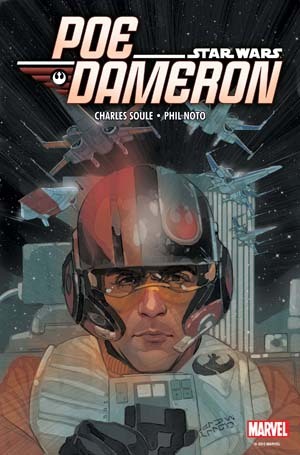 Superstar creators Charles Soule (Lando, Obi-Wan and Anakin) and Phil Noto (Chewbacca) take you to a galaxy far, far away for the new adventures of Poe Dameron - former Republic flyer turned Resistance fighter and the best pilot in the galaxy! Set before the events of Star Wars: THE FORCE AWAKENS, be there for Poe's daring adventures as they take him to the edges of the galaxy and back. Hand-picked for the Resistance by legendary General Leia Organa, follow Poe, BB-8 and a squadron of X-Wing pilots on a top-secret mission that could hold the key to saving the galaxy. But with the full might of the First Order on their tail, will the operation be short lived? STAR WARS #1 THIRD PRINTING VARIANT SIGNED BY ALEX ROSS!